Hanging baskets, containers and flower pouches add a whole new dimension to gardening, helping to utilise all the available space. With hanging baskets and flower pouches you can brighten up a sunny wall, or with the right choice of plants, even add colour to those tricky shady areas. Why not grow fresh herbs throughout the winter with an indoor basket next to a sunny window! If you have a greenhouse or can provide frost protection for your plants, then you can start planting up baskets, flower pouches and containers in April. This will allow the plants to reach full flowering size early in the season. If you don’t have any means of frost protection then baskets and containers are best planted up in early summer after the risk of frost has passed. Alternatively planted hanging baskets and containers can be placed in a sheltered position outdoors during the day and brought under cover at night until the risk of frost has passed. The traditional mesh hanging basket is made of plastic-coated wires although solid plastic hanging baskets are available. Wire hanging baskets require a liner to hold in the compost and plants. There are many types of liner available although the most inexpensive and versatile is sheet plastic, which can be cut to size and disguised by placing in a layer of straw or hessian before lining. 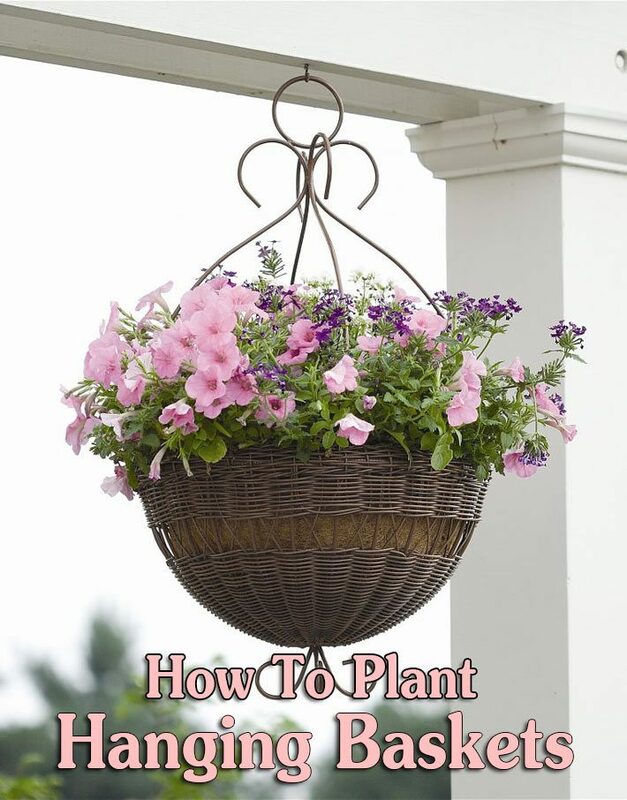 A general rule of thumb when creating a hanging basket is to use one plant per inch of basket diameter – so 12 plants per 30cm (12 inch) hanging basket. The only exception to this is when you use strong-growing plants such as Fuchsias and Geraniums (Pelargoniums). 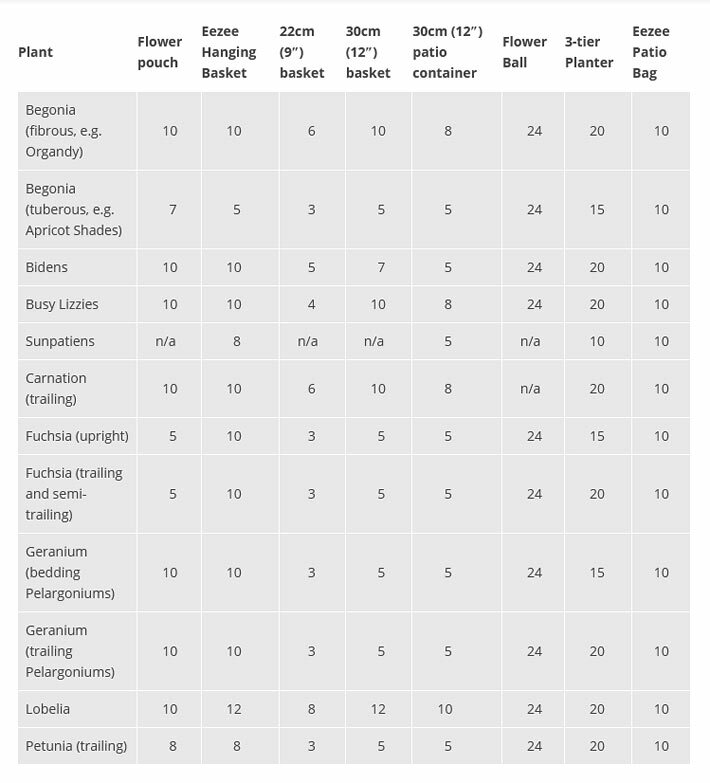 In this case it is best to only use 5 plants per 30cm (12 inch) hanging basket. 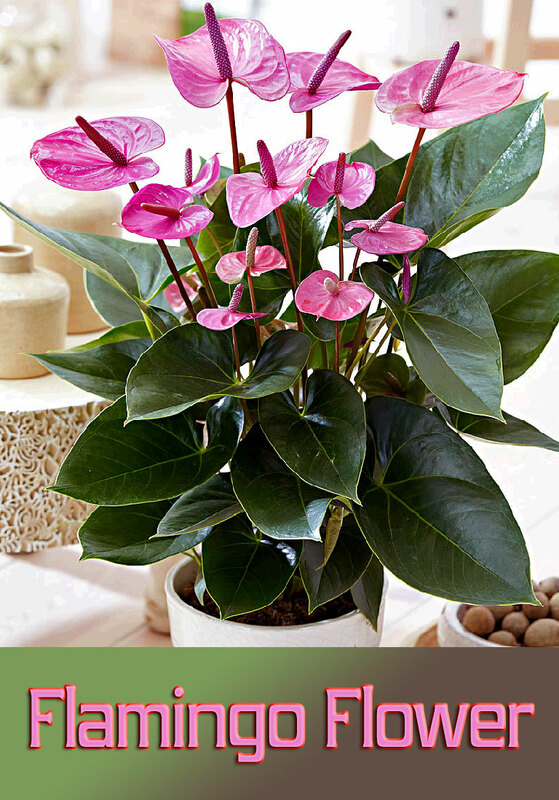 A 30cm (12 inch) container will comfortably accommodate about 6-8 plants. 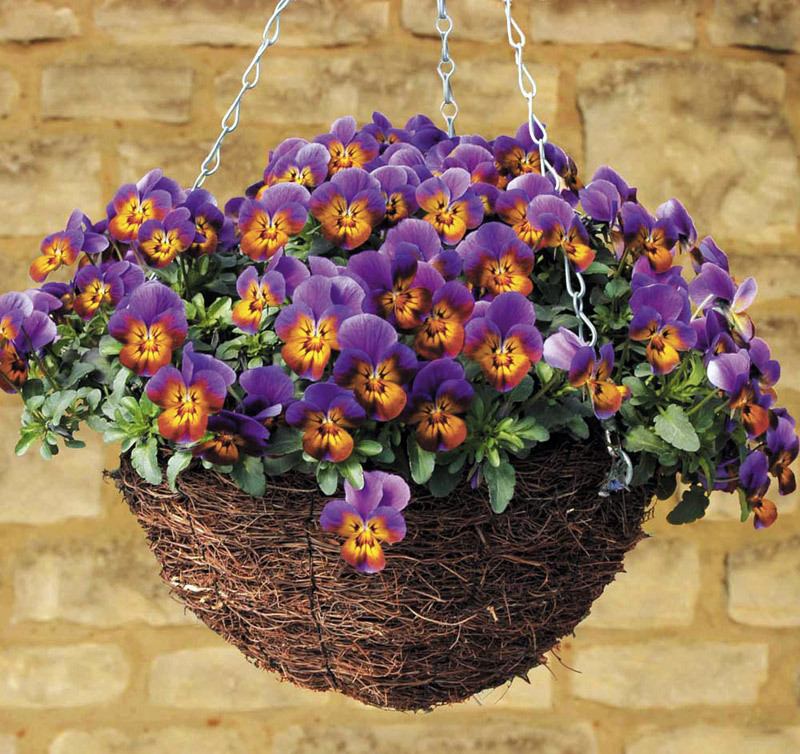 Start by placing your empty hanging basket on a bucket so it is held firmly in place whilst you add the plants. Adjust your chosen liner so it fits the basket snugly. Trim off any excess material that protrudes above the rim. Using sharp scissors make a series of 5cm (2 inch) slits in the sides of the basket liner to accommodate trailing plants. The trailing plants will eventually fill out and mask the wire frame. If the basket is deep enough, two layers of slits can be placed around the basket. Fill your basket with the compost mix until it is level with the first layer of slits and gently firm the compost down. Insert your trailing plants by pushing the plants ‘head-first’ from the inside through the slits. To protect delicate young growth, try wrapping your plant loosely in polythene whilst you guide them through the holes; once the plant is in position with the root ball resting on the compost and the leaves on the outside, remove the polythene. almost full – leave a 5cm (2 inch) gap below the rim. Plant further trailing plants around the rim – try and plant them so they grow in between the plants below. Choose a bushy upright plant for the centre. Fill in around the roots with further compost mix; aiming to keep the soil surface an inch below the rim of the basket to prevent compost spilling out when watering. To finish, water your hanging basket thoroughly with a fine-rose watering can and stand it in a greenhouse to grow on. If you don’t have a greenhouse and your basket contains half-hardy plants, you will need to bring your basket under cover each evening to protect the plants from frost. 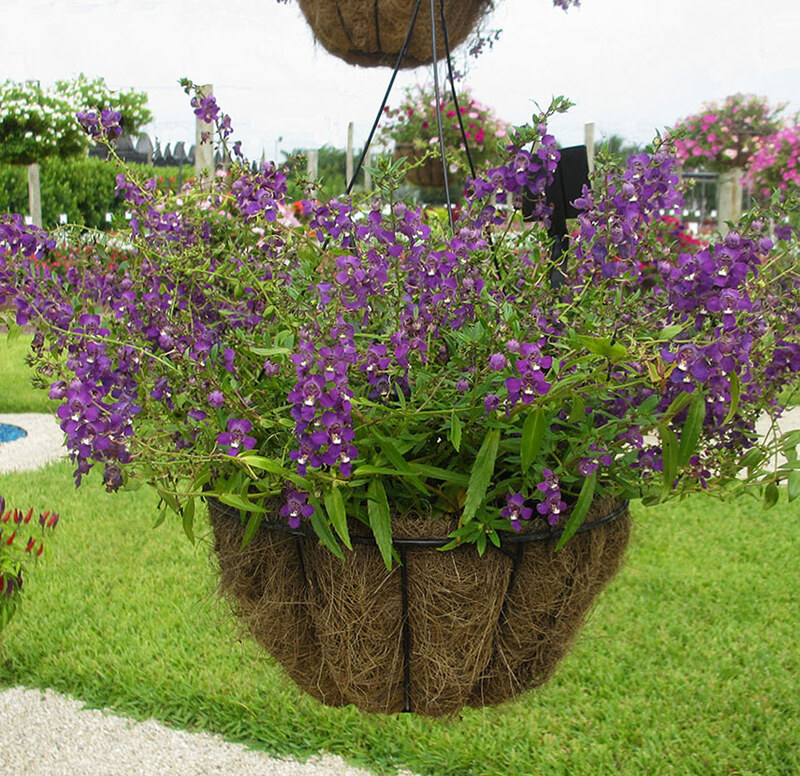 Flower pouches are an easy alternative to hanging baskets. Simply fill the pouch full with the same compost mix you would use for a hanging basket (described above) and peg the top closed whilst you plant the pouch up. Lay the flower pouch flat and gently push one plant into each pre-cut slit. Water around each plant and leave the pouch laying flat in a bright, frost-free position to grow on. After a few weeks you can remove the peg and hang your flower pouch upright. Hanging baskets, containers and flower pouches should be placed in their final position once all risk of frost has passed. If your hanging basket or container has been living in a warm greenhouse then harden the plants off for a week before placing permanently outside. Use a strong bracket to hang your basket from. Provided your plants aren’t shade-loving, choose a sunny and warm location, preferably south-facing so your baskets and containers receive full sun all day. Try and avoid windy sites if possible. Due to the volume of plants in hanging baskets and containers, they dry out very quickly in fine weather so keep an eye on the soil moisture, and water if the top half-inch of compost feels dry. If only the surface is dry, leave watering until needed. One to tip is to feel the weight of your hanging baskets before and after each watering. You will soon get used to the weight of each basket which is an excellent indicator its water content. Try watering in the evening to reduce the loss of water through evaporation. Some plants such as Lobelia do not recover if they become too dry so take care! 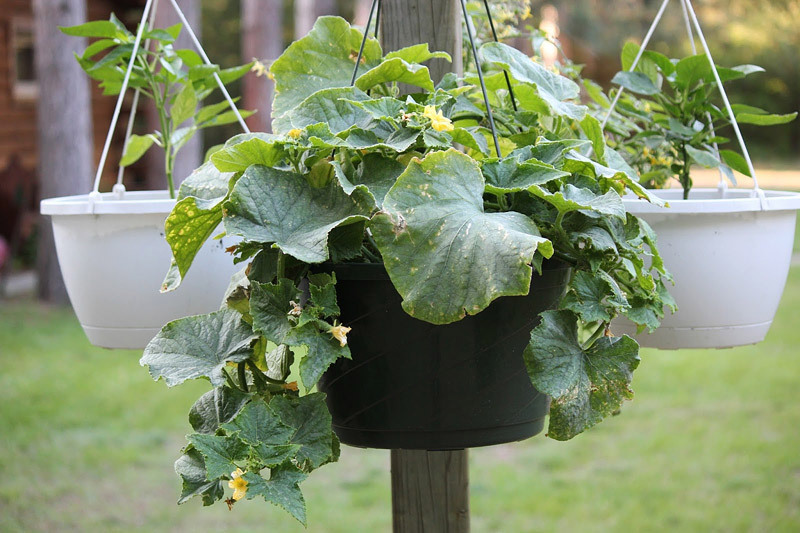 Why not try growing your own vegetables and herbs in a hanging basket or container? 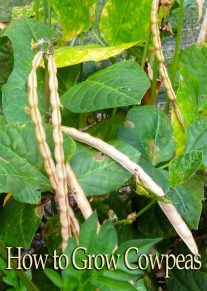 These can be both attractive and productive and you can try growing all sorts of edible plants! 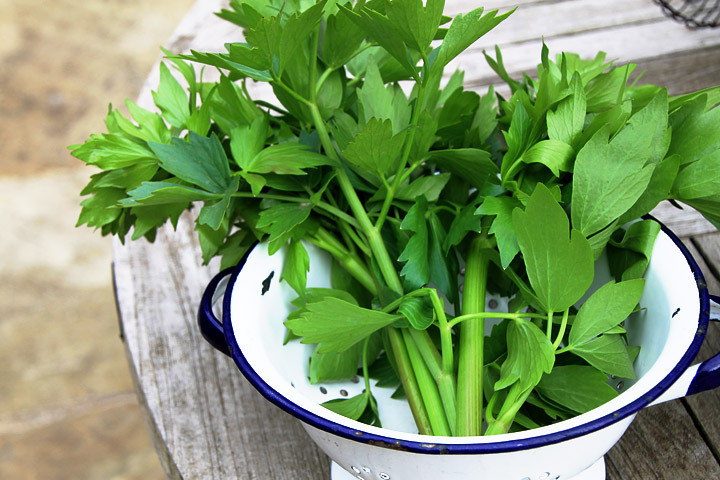 Many herbs and vegetables have decorative features such as coloured leaves, seed pods or fruit. The best plants for hanging baskets and containers include bush cucumbers such as ‘Vega’ or ‘Fanfare’, chilli peppers, cut-and-come-again lettuce such as ‘Salad Bowl’, basket tomatoes, strawberries, peas, and dwarf beans. When growing strawberries in hanging baskets, incorporate a slow-release strawberry fertiliser into the compost for the best crops. Herbs suitable for hanging baskets include parsley, basil, sage, chamomile, chives, marjoram, sorrel and thyme. When lining a vegetable basket, always choose sheet plastic or polythene to help with water retention – it is essential that vegetable baskets do not dry out. Also, vegetables and herbs do need more space than bedding plants, for example you would only need 3 trailing tomato plants per 35cm (14 inch) basket or container. Bush cucumbers become quite large so 1 plant per basket or container would be sufficient. Position your basket or container in a sheltered, sunnysite, although herbs and cucumbers will appreciate some shade. Hanging baskets and containers don’t just have to be on display for the summer, they are just as effective in brightening up a winter or spring garden. Good perennial plants for winter hanging baskets and containers include dwarf conifers, Euonymus, dwarf Hebes, Cordylines and Heuchera, which are all good for structure. Heathers, Thyme and Gaultheria procumbens are evergreen and have good spreading habits. Small varieties of grasses such as Carex flagillifera and Carex comans will spill over the sides of a basket or container providing a trailing effect. Other good trailing plants include ivy and periwinkle (Vinca). For colourful flowers try Cyclamen, polyanthus and winter pansies.